Woodbridge UK, September 15, 2014 — The British Ministry of Defense is still withholding high-level UFO public policy papers, along with other key information, despite the public stance that all material has been transferred to the National Archives, according to John F. Burroughs, a retired USAF security officer. Burroughs, 54, was stationed at RAF Bentwaters in 1980 and witnessed one of the most significant UFO events in English history. According to Burroughs, the MOD commissioned a Top Secret Technical Memorandum 55/2/00 in 2000, which was intended to provide the pretext for closing down the MOD UFO desk. That Memorandum included a Key Recommendation that "It should no longer be a requirement for DI55 to monitor UAP reports as they do not demonstrably provide information useful to Defense Intelligence." 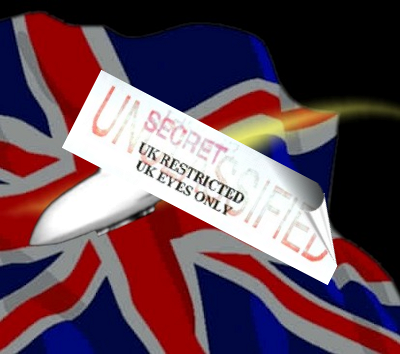 Subsequent to the internal release of the Technical Memorandum, the UK MOD shut down the public UFO (UAP) reporting desk and began a process of transferring all of the UFO reports to the British National Archives. According to the National Archives web page dated 21 June 2013 they stated they had today released its tenth and final tranche of UFO files, containing 4,400 pages of UFO policy, correspondence and UFO sighting reports covering the final two years of the Ministry of Defence's UFO Desk (from late 2007 until November 2009). The files reveal for the first time the reasons behind the closure of the UFO Desk and how sightings had become a social phenomenon making tabloid headlines and sparking a disclosure campaign for 'the truth'. This seeming act of transparency was apparently a ruse, as FOIA requests by Burroughs have revealed two further versions of the truth. In an initial response the MOD admitted the existence of 6 crucial UFO/UAP public policy papers which have NOT been released. According to that version UFO/UAP Policy papers dating from 1971 through 2004 have been held back. These papers contain the MOD public information policy for over three decades, including a change from the use of the term 'UFO' to 'UAP', in June of 2000. Burroughs feels this change was an attempt to conceal MOD information on the UFO issue from June, 2000 onward by referring to the phenomenon in question as Unidentified Aerial Phenomenon, (UAP) rather than the well-understood "Unidentified Flying Object" (UFO). The change would allow the MOD to make the claim that no further information on the UFO is being held, while maintaining information on the UAP. In response to a follow-up FOIA request, the MOD revised its position to say that they were still maintaining 18 UFO documents as classified. The MOD said that the documents were being 'prepared' for public release -- meaning reviewed for material that should remain redacted -- at a later date. When Burroughs submitted a request for early release of the classified documents, the MOD declined, claiming that doing so would 'delay the planned public release" of the material. "This makes little sense to me," Burroughs said, "as releasing them to me would accelerate access to the information contained, not delay it. The MOD is clearly dragging its feet on full disclosure, while presenting the illusion to the public that it has already happened." Nick Pope, Co-Author of the book Encounter in Rendlesham Forest with James Penniston and Burroughs, and former Directorate of Defense Security, Ministry of Defense who's gone on record saying Rendlesham might be the turning point in history that leads to the explanation of the UFO phenomenon" stated this when he learned of Burroughs FOIA discovery. "I knew for sure that not everything had been released, because by the MOD's own admission, some files/documents had been lost, some destroyed, some redacted and some withheld altogether. Also, material where the information owner is a defense contractor (e.g. some of the Project Condign working papers) is exempt from disclosure altogether, as private companies are outside the scope of the Freedom of Information Act". The bottom line is this: whether it's exempt from the FOIA entirely, withheld/redacted under exemptions to the FOIA, destroyed or lost, some material on Project Condign and on the Rendlesham Forest incident has yet to emerge, and some may never come to light”. Burroughs will be presenting the results of his active FOIA request program and his analysis of MOD Technical Memorandum 55/2/00 at the Woodbridge Community hall Station Rd Woodbridge Suffolk IP12 4AU on Saturday September, 20th at 7:00pm. Also appearing with Burroughs will be Richard Dolan, Larry Warren and Gary Heseltine. According to Burroughs, the significance of the contents of the Memo 55/2/00 has long been overlooked by the research community because it was deliberately obtuse in nature. The Memo is technically complicated and the writing was adroit in the process of stating key facts while presenting a facade that the phenomenon under study was one of several forms of rare, but naturally occurring weather aberration. "You have to know what you are looking for," Burroughs said, and understand what is actually being stated. The memorandum is a masterpiece of bureaucratic double-speak." Among other points Burroughs will cover in his talk are the fact that there is an international race to weaponize the technology employed by the phenomenon. According to Burroughs, "The memo states clearly that 'Russian, Former Soviet Republics and Chinese authorities have made a co-ordinated effort to understand the UAP topic.' and that high level scientists, astronauts and senior pilots have been appointed to study groups." The most significant accomplishment Burroughs has made to date is to correlate the described characteristics of the 'true phenomenon', as he puts it, under study by the MOD, with a 2003 paper by Jaques Vallee and Eric Davis and a 2010 paper printed in the Journal of British Interplanetary Science by Hal Puthoff. Puthoff's paper, published a decade after the MOD memo, describes a theoretical propulsion system for interstellar travel, based on the Alcubierre 'warp drive' concept. "It boils down to this:" Burroughs stated, "Puthoff's predictions for effects of a drive capable of interstellar travel match the effects of the UFO Phenomenon noted by Vallee/Davis and they match the effects described by the MOD of the UAP Phenomenon under study." "Most significantly, the predicted effects of the theoretical interstellar drive on humans in close proximity match those of the MOD - which could not have known of Puthoff's theory at the time of the writing -- and they match the symptoms I exhibit from a close encounter with the phenomenon while on duty at Bentwaters." "I am convinced that this is the reason the DOD has classified my medical records and attempted to doctor my Service Record to show I was not in service at the time, to allow the VA to deny me benefits, but more importantly, keep the medical information about my condition a Classified secret.